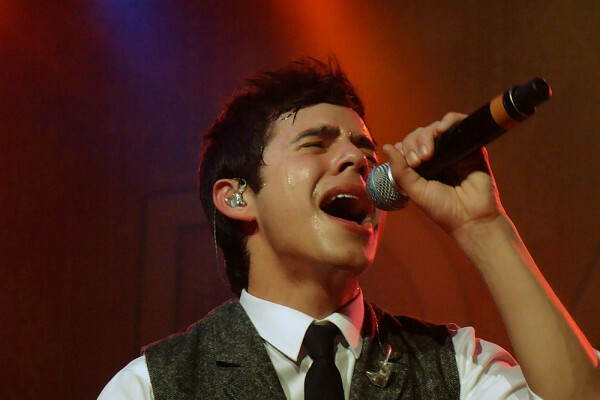 « David Archuleta ~ Christmas Album > Winter In The Air & Tour Dates! 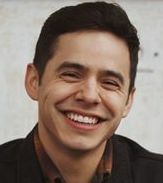 This entry was posted on Friday, September 7, 2018 at 10:58 AM	and is filed under artistic freedom, concerts, David Archuleta, Holidays, Merry Christmas, music, Musical icon, Uncategorized. 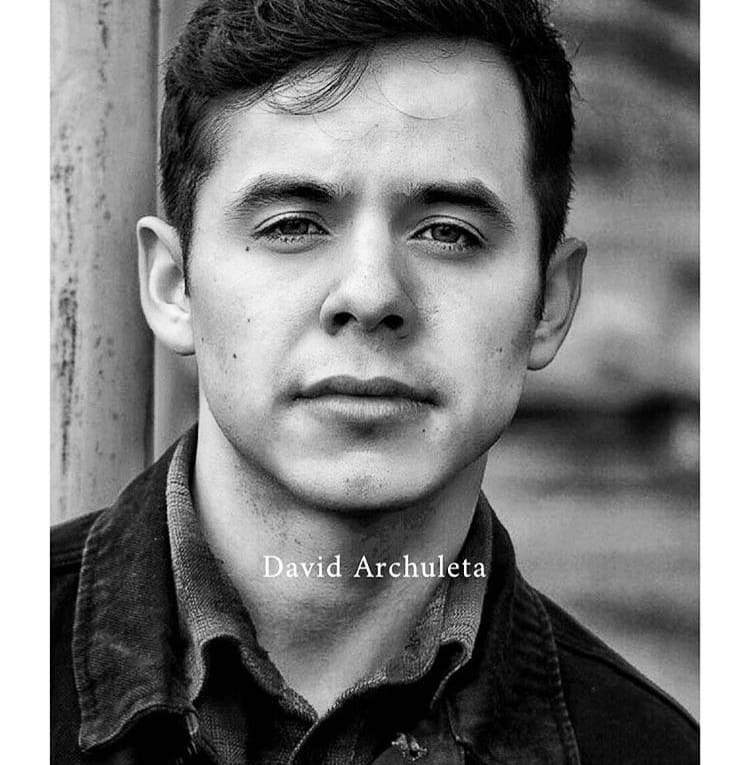 Tagged: Archuleta, CHRISTMAS, Christmas Every Day, David Archuleta, Melinda Dolittle, music, Staying true, The best is yet to come, the Voice, TOUR, what just happened?, Winter In The Air. You can follow any responses to this entry through the RSS 2.0 feed. You can leave a response, or trackback from your own site. I have tickets for Franklin, Tennessee!!!! Oh my gosh!!!! I can’t believe I’m going God willing! Yay Tawna! I have Troubadour tickets!!! That was a crazy fun venue! Looking forward to the album and tour videos. I hope O Ven is in the Spanish EP and he sings it on tour. Well, I have tickets for Friday night. Thurs night doesn’t go on sale til next week and now I know I’m going, I can jump in there and get better seats. 🙂 There is no way we are going to Nashville and not go to both concerts!!!! 🙂 I just don’t understand the thing we have for this guy! 🙂 lol Hope to see some of you there one night or the other. Jans, great! Theatre says tickets for the 13th will go on sale next Friday so we have to be ready! Here is a fun picture take by a fan at VIP. Ray, I’m in SoCal but will be going to Tennessee as my retirement vacation :))))) Glad David is heading our to Florida! Ray, I live in Kansas and the closest one to me is Nashville, so that it where I am going….to both concerts! Got my tickets this am and even the VIP! Oh yeah! 🙂 I sure would like to have met you. One of these days… It is always great to meet the fans. Dja, are going to both or which one? 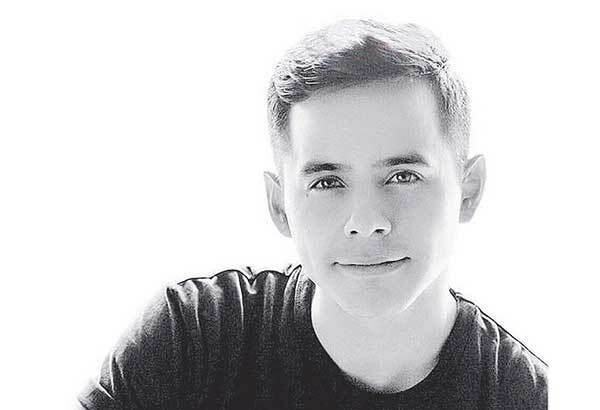 What a nice sharp, snazzy photo of David on the this Sunday! Thanks, Abs! Yeah Abrra, it works for me, too!! 🙂 Thank you. 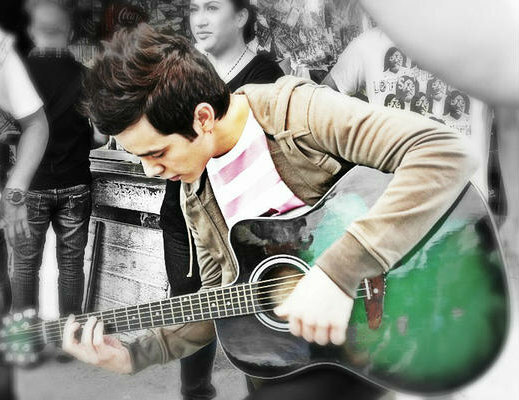 Thanks to Vanny for a wonderful edit. Happy first day of fall everyone! Today my baby daughter turned 50! Hard to believe on where the years go…so fast! And what a cute one! 🙂 Thanks again for the great Sunday puzzle Abs and Lady V! Love the puzzle. Even Kermit wants his pic taken with David. I’m excited to turn over a new page on my calendar because there are David dates on there!! Happy October. Fun puzzle, Abrra. Thank you. Haha turns out it was just a mass mail about his Christmas album and tour. Still, it did have his name in the “from” box. Listen to Dios Muy Alegre Albergo on Spotify. OMG O Ven is on the Spanish EP! I am going to have a very merry Christmas listening to it. Hope he sings it on tour. Thanks for the Sunday puzzle. Always special. About that goat, though. I have never kissed a goat. And it’s not on my bucket list. Nope. Tawna, add me to your list of clean-shaven preferers. Wonder if he will show up at BYU scruffy? Excited to see him twice this week. Perhaps he will do one show with stubble and the other smooth cheeked. Fen, so hoping for O Ven on the Christmas tour. How could he not? Jan, so great that you get two nights in Nashville with David. Trying not to be envious. Tawna, no tomatoes from me…I like the clean shaven David too! I don’t like facial hair on any guy. I accept the task of extra cheering. Cheerfully. 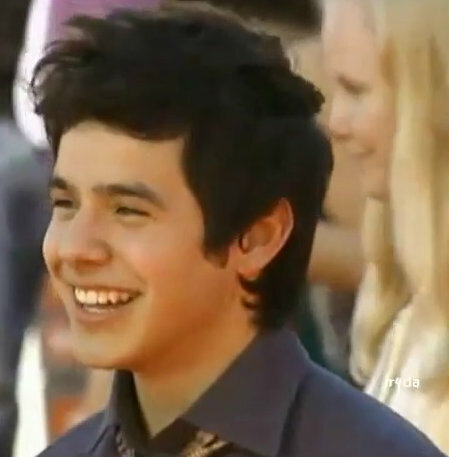 David was a little scruffy. Not too scruffy. Just right. The highlight of the show and pretty much my whole life was David singing Don’t Let the Sun Go Down on Me. The audience was stunned. A rousing SO followed. and continued. How can anyone not be a fan? He did an awesome performance with that song Dayzee! **hunker down for the win** But then, that’s nothing new in the world of David. Right?! Wish I could have met up with you … long story about my night. He is wowing another crowd right now, go David! Thanks for the puzzle. A great reminder of 2 heavenly nights. 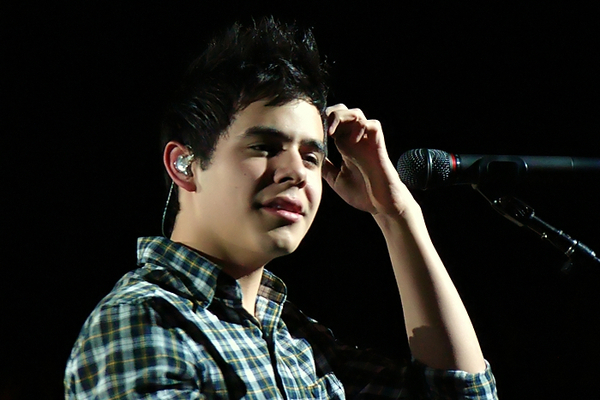 Gosh, that Archuleta kid was oh so good! The first night was kinda like another “not a David Arculeta concert”. He certainly stole the show. I felt it was not quite so lop-sided the second night without Tawna there to raise some noise. Hoping to hear more from her. The first night I went with a friend who could not leave work early, so we barely made it through the traffic and parking and finding our seats. The second night I went with my granddaughter Julie and we arrived very early. We went to BYU’s Paleontology Museum, the Museum of Art and ate at the school dining hall. Had plenty of time to visit with other fans and Emily at the merch table. All of the time we are doing this there is the excitement of knowing we will see David soon. Electricity in the air for all of us. Both shows were sold out and it was amazing to see so many filled seats way up in the rafters. Wondering what the attendance numbers were. Still living in that precious state of David hangover. Nobody can irritate me now. I love everybody. Colbie was great. Really liked her. Next concert for me in St. George 12/3. Life is terrific. Still addicted to Don’t Let the Sun Fall Down on Me. First thing in the morning, last thing at night. A few times during the day. Gotta have it. Love watching the guitarist fellow behind David on the Light Shine video of Show 2. When I can get my eyes to leave David long enough to watch him. Dayzee, those David hangovers are something else, that’s for sure! And no wonder you are so nice and love everyone, with all the David concerts you get to go to! He always puts people in good moods! 🙂 Just listening to him singing does it too. But the “in person” thing makes it tops! My granddaughter can’t go because of work, so I have one ticket if anyone is interested. It’s for Friday night in Nashville. Sold out and the seat is in Row K seat 4. $35.00. Good luck with selling your extra ticket, Jan. I wish I could hop on a flight and be there. It sounds like a good seat, and we know the concert will be a good one!! Tawna, wish you could too. I emailed Emi that is here sometimes, though I haven’t seen her lately. She’s lives in Nashville and met me and my daughter a few years ago at the Bluebird Cafe when we visited there. Haven’t tried too hard yet, like putting it on FOD yet so if I don’t hear from Emi, I will. Now to the important stuff ! Loved the puzzle. A photo example reminding me of how much fun David is. Always makes me smile. Kooky puzzle. 🙂 Love that David smile! Thanks Abrra!! David is so funny. That is the second photo that I seen him sticking his tongue out, the other was with his mom a few years ago. Thanks Abs. Got a hold of Emi from Nashville. She is already going to the concert so doesn’t need my ticket. She is going to keep a look out for someone down there that might want to go. Still haven’t tried on other sites yet. Those popcorn balls were delicious! Thanks for sharing the recipe. I make them often. Wish I could use that Nashville ticket. Dayzee, I can’t just stop at one! 🙂 Sure wish you could use that ticket too. Dayzee and Tawna, don’t know if you know it or not but David will be at the Deseret Book (Flagship) store at 45 South Temple signing his new Christmas cd’s. Dayzee – I missed it!! Hopefully someone will have it up for us!! Someone posted the song on FB earlier so got to see him sing but not the interview. Jan, I saw the interview on FB but not the song. Is the Spanish album out yet? Got my album today in the mail..right on time…listening to it for the 3rd time…he is so awesome and there is something special about David and Christmas songs. Love the ones that he wrote..amazing! Tawna, not sure about the Spanish album as I haven’t heard anything about it. Well, I just seen this on FB. Went to see David at Deseret Book tonight. Got at the end of a line that snaked around the store. People in front of me went to see how far it was to the front of the line. They came back and said there were some women at the front that had been there for 3 hours. I said I probably knew those women. Sure enough. The first six people in line were usual suspects. They insisted I stay and those behind them in line seemed to think it was a great idea. Awesome. True David fans are always kind. When David was signing my CD’s I asked him to sign one for Jan because I would not have been there if she had not told me about his appearance tonight. He laughed and said they had tried to keep it low-key. I told him it was a pretty long line for being low-key. He craned his neck and could see about 1/10th of the waiting fans. “Ooooh” he said. Gotta find me that Navidad. Have been listening to Navidad. Absolutely beautiful. So grateful for David’s music. Thanks, Abs for the great puzzle with the million dollar smile! Love to see that guy happy…he deserves it. Aah. Two Davids. The only thing better than David is more Davids. And the only thing better than David singing is David singing with David. Love all the David background vocals. Thank you, Jan, for the heads up!! I love the album and ep. I can’t decide which song is my favourite. I am a bit disappointed that O Ven is not the one he sang in Chile. Nonetheless, the two versions he recorded are beautiful and I love them. 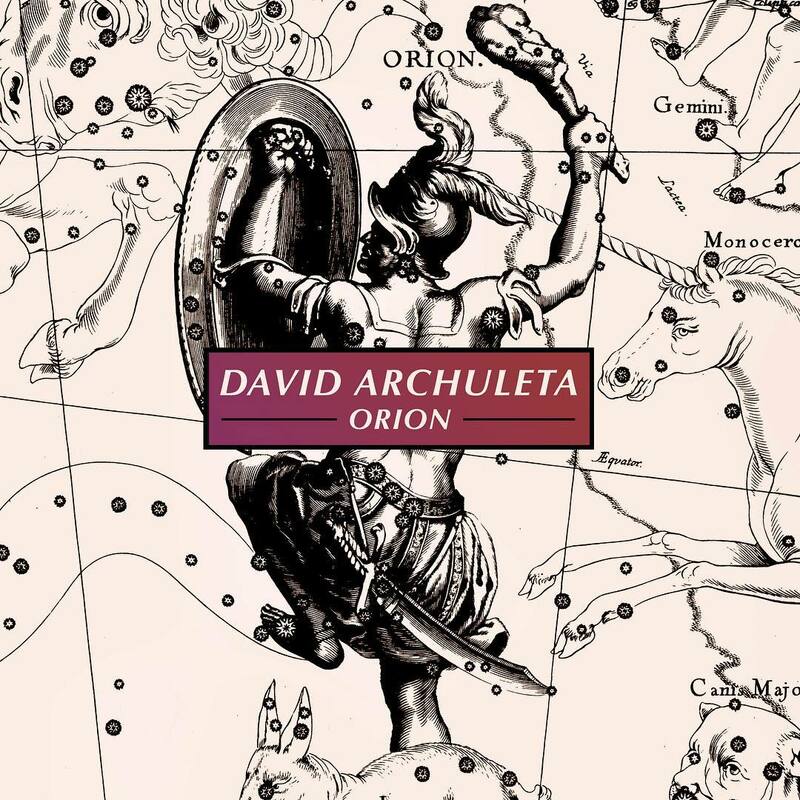 After listening to the EP, I am now more convinced than ever that David should release a Spanish album ASAP. This might seem weird but I hope that he records an album of torch songs one day. 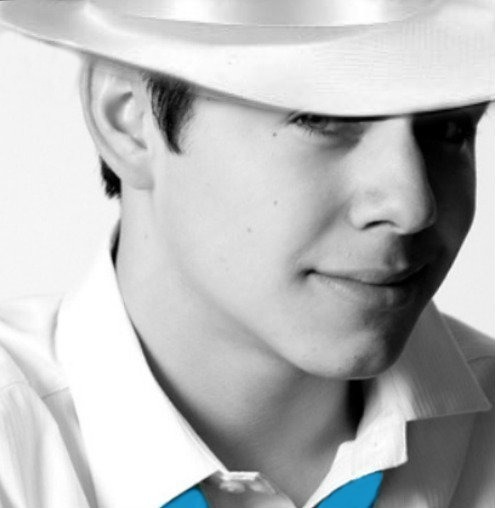 I love the whole album…I love the different ways he sings the different songs. Always looking forward to the next song…then it’s over and I listen to it all over again! 🙂 Love his new Christmas in the Air video…goes with the words so well. The dancers are from World of Dancing, the dance competition on tv where JLo is a judge. If I’m not mistaken, she produces it and maybe directs it. Fun to watch…not on right now. Probably come back up in January. Thanks for our Sunday puzzle, Abs! 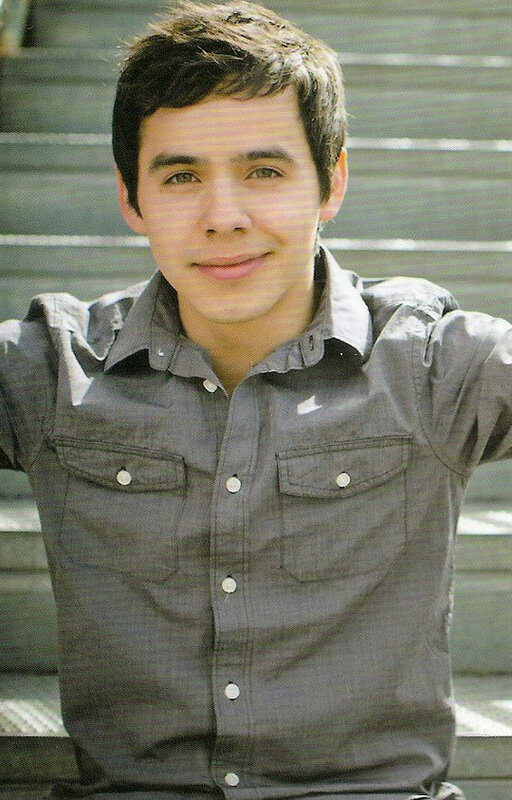 Love our serene David. He is just so special. Thanks for the puzzle. Always look forward to the Sunday David. So exciting to see the Philippine videos. Mr. Christmas. Fun doing a puzzle of David and Catsu, his sister’s cat. He is such an animal and little kids lover. So compassionate. Thanks, Abs. Hope you all had a great Thanksgiving. I went non stop for about 3 days and never even got on the comp except to ck my FB page on my phone. Here in my neck of the woods, we had a blizzard today that is just waning down. All schools are closed for tomorrow. It was a white out all day and everyone just stayed in. So happy my lights stayed on…a lot of people lost theirs. Leaving tomorrow for a meandering journey that will take me to see David 12/3 at Dixie State University. Excited to be on my way. A great celebration with family, friends and David. WooHoo! I’m so hopeful that some videos show up from the orchestra concert in San Bernardino!! Hope more videos turn up. I really really need to attend a David with orchestra concert at least once in my life, preferably at Carnegie Hall. 101, Fenfan, the link said it was unavailable on my comp. Love the “Winter in the Air” video. I agree that it would be awesome to hear David in Carnegie Hall. His voice slays me! Unfortunately, SandyBeaches & I can’t attend the NY & Ct concerts and I really would love for someone to take advantage of seeing David in concert so I would like to GIFT the tickets I have to anyone who wants them. I initially posted them for sale at half price but got no response probably because the venues are not sold out YET. I have 2 Guaranteed Seating tickets for NY and 2 GA tickets for CT. It would be great if a fan of David who may already have tickets would take these tickets to give away to someone who is buying tickets at the door of the venue the night of the concerts. These are Etickets which can be emailed for downloading. Are there any takers? Still floating from the St. George concert. Went with my daughter and her friend. When David sat down on the stool he mentioned his pants were a little tight for sitting. Hahaha. Lots of happy tears at that show. 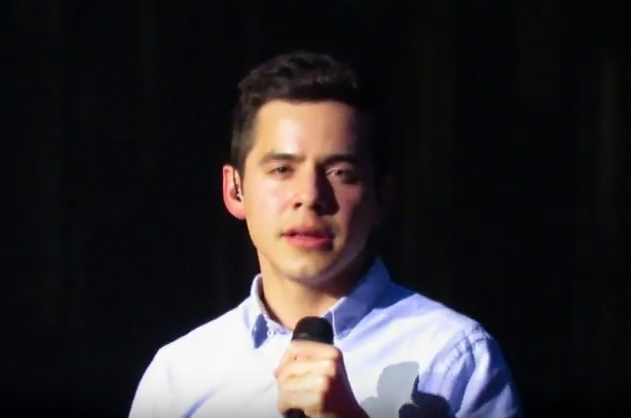 David crying during “My Little Prayer”, me crying all the way through “O Holy NIght” . Then on the way home my daughter started talking about how perfect the evening had been and burst into tears. David affects all of us. My daughter’s friend said the show was all she needed for Christmas. No sox. David has no sox. And it’s winter. Surely fans will send him dozens. Last night was super. Went with my daughter-in-law. The first four rows were loaded with longtime fans. The early tickets (like mine) listed the start time at 6:30. Later tickets said 7:30 pm. So about 100 people were there expecting the doors to open at 5:30. Nope. Doors opened at 6:30. Or so. It gave us a long time to catch up with other fans and meet some new ones. His set list is perfect. Before the show some of us older fans were talking about how old we were getting and wondering how many more concerts we could get to. After the concert we all agreed that as long as someone would wheel us down the aisle we would be there to hear David sing. On the drive home my daughter-in-law says, “Do you know what I like about David? His voice is always so pure. 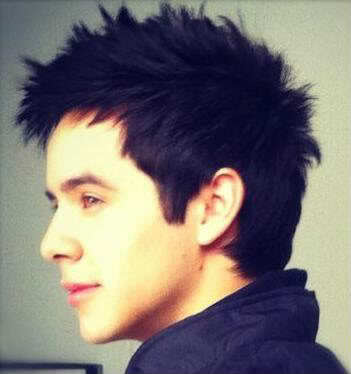 Every time I see him I appreciate him more.” Then it was “Do you know what I love about David? 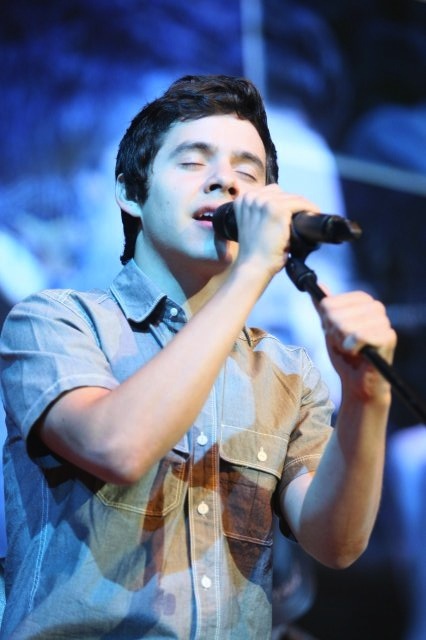 He has so much passion!” Then it was “Do you know what I love about David? He is so sincere. Nothing false about him.” And on and on. I never get tired of hearing about David. Dee, wish I could get there to use your tickets. Sorry you will miss it. The glow is always with him. Wonderful puzzle, beautiful colors! Thanks Abs and JennyJones. He looks so good glowing under the spotlight! Thanks to Caylin Makenzie for a great picture and gift to David. I vote it most unusual. Thank you for the puzzle, Abrra. And I vote with you. What is he looking at? Last Monday’s show in Orem was, as usual, a delight! I had floor seats — I NEVER deliberately sign up for floor seats!!! To me, they are the worst! Sorry, Dayzee. There was a guy a couple of rows in front of us that was wearing a fedora-type hat that no one could see over or around. Finally, the guy right in front of us asked him to take it off. That helped some, but I never did see anything below David’s waist. Hmm, that sound bad doesn’t it?! What I mean is that I couldn’t see his feet or legs dancing, his short pants, or whether or not he was wearing socks. But, I heard The Voice just fine, and that’s what matters the most. We were a quite early getting into the auditorium and saw Dayzee right off the top. We visited with her for a little and met her new friend, Heidi I think, that she met in the VIP. Anyway, David’s performance was amazing and I’m glad to have been able to witness it. It will be interesting to see if he adds any Utah shows to his Spring tour. Oh boy! Sunday puzzle. Many thanks to Abrra. Tawna, it was so good to see you and Ron. Wonderful to see longtime fans. I agree floor seats are not for short people. Unless you are up front. I was lucky to have a pretty good view from row 11. The people in front of me were the last ones to arrive, sometime midconcert. Obviously did not know what they were missing. I would also be interested in Utah shows. Of course I would. My new friend had been a David fan when he was on AI but lost track of him immediately after the end of the show. Sometime this year she ran into him online. She was smitten and has been going to every concert within reach for her. She was amazed at all the work he had done when she wasn’t looking. Gathered up all the new music and loved it. She made a large purchase at the merch table. Orem was her first VIP. She was understandably traumatized, and wasn’t sure exactly what happened during the photo taking. I will see her again in Richfield. I watched David sing Joy to the World with an abundance of energy and emotion. As he sung those last awesome phrases I thought he must be completely drained. Before I can catch my breath he is into Holly Jolly Christmas. I don’t know how he can give so much of himself at each show, night after night, and still be so awesome. And to think he was in Utah on Monday and Florida on Tuesday! How. Does. He. Do. It!? 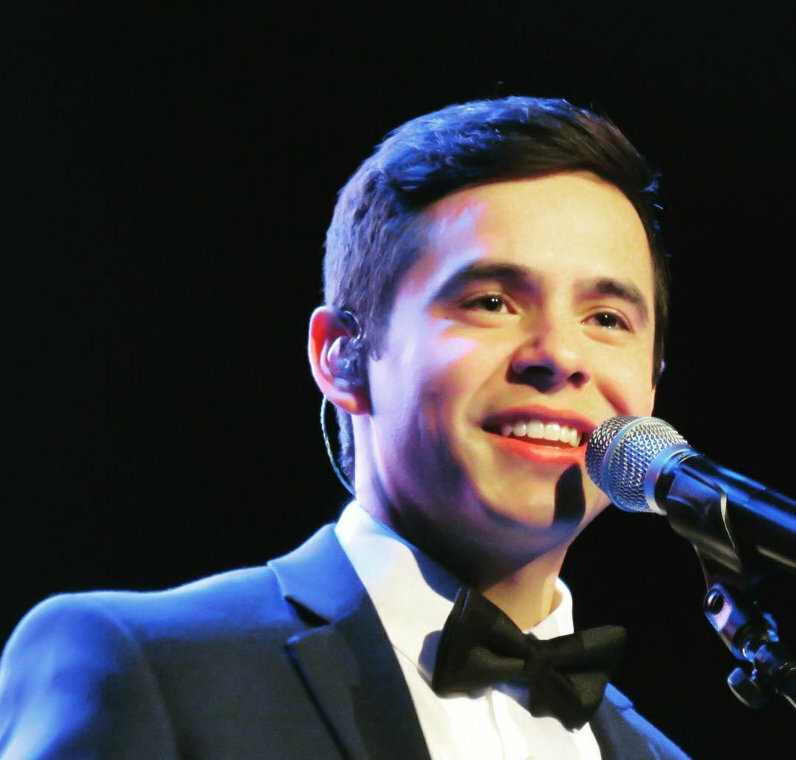 Hard to believe that his Christmas tour is already winding down and his Spring concerts are already listed and some tickets are on sale already! 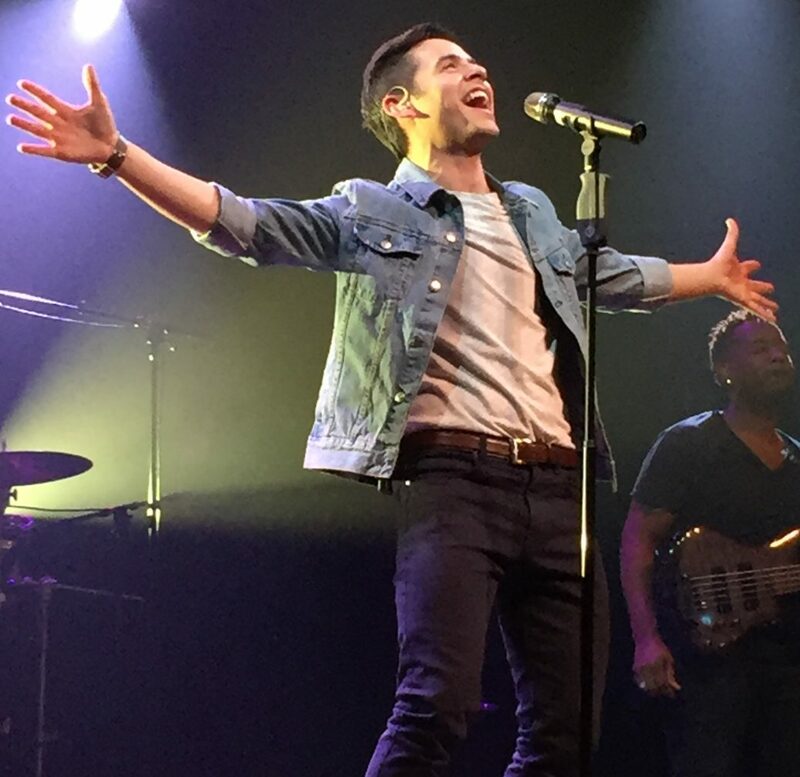 Of course, his 2 nights concerts in Nashville were pure bliss! My daughter was a fan but even more so now. First night with us having the VIP, it’s always special, always special to meet David and talk to him a bit. Sat on the front row and soaked it all in. We sat by Janie from CA and she said that once she finally seen a concert where she was fully satisfied, it was so chocked full. 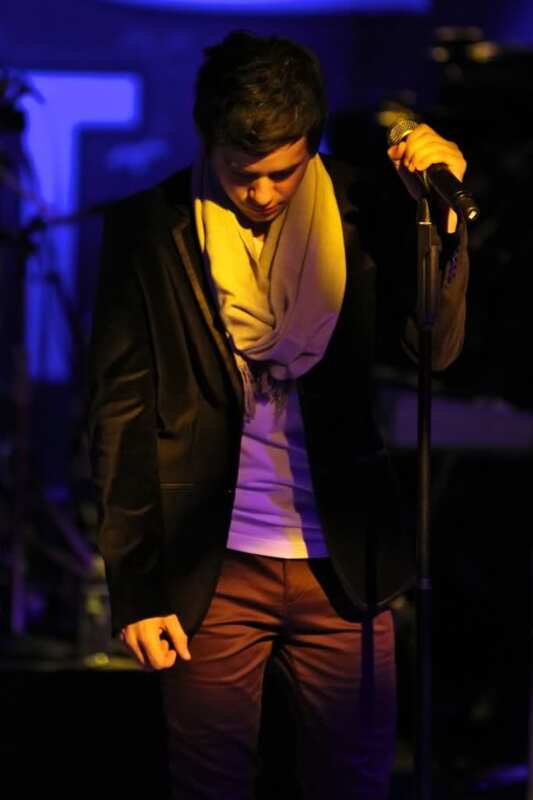 I always want more when he stops singing…don’t know if I will ever get to being totally satisfied. I always more, more! 🙂 Guess I’m a glutton…the poor guy! After he talked about the orphans that he supports he sang Some Children See Him. At the end of the concert, my daughter said that he didn’t sing Mary, Did You Know? I said maybe he will tomorrow night, sometimes he changes the list. That night on FB he thanked everyone for coming and asked what was the part that stood out to us. I said it was all super but we missed hearing him singing Mary, Did You Know?. The next night, sure enough after his talk about the orphans he sang it! 🙂 My daughter was ecstatic and everyone loved it. He got a standing O when he sang He is Born! ♥He was really surprised and thanked us more than once. Just love that guy! The luncheon was a breakfast and we didn’t end up going. That night we sat in row K but he is just as awesome wherever you sit! A couple from northern Ill. sat by my daughter and they had heard him on the radio so decided to come to the concert. We told them that they were in for a treat. They loved him! So you know that David got some more fans. They couldn’t believe that fans go from one concert to the other and they call them groupies. 🙂 He was so happy that he finally had met a groupie! LOL 🙂 I had a girl next to me that loved David too, so we had our own little fan club back on row K! Everyone was pretty well into his songs. Especially when he sings CRUSH!!!! Yay, yay, yay, yay!!!!! And it’s still my ringtone after 10 yrs! 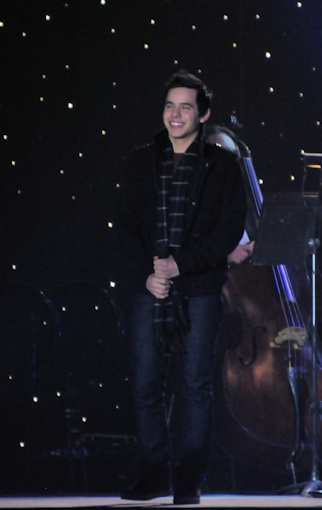 On a side note, he was in the Hollywood Christmas Parade and the whole show started out with David singing Christmas Every Day! I was so surprised wondering when he might be on there and Bam, there he was at the very beginning! Also, he was in the parade somewhere in the last 15 minutes of the show. 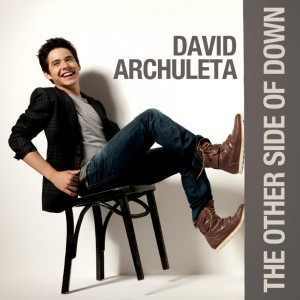 In his own little car with David Archuleta on the side! His new PR is sure getting his name out there and I am so happy about that. Happy on where he is at that he has worked so hard to be. He is totally worth being #1 on everyone’s list. Jan, I vicariously enjoyed your trip to Nashville. Thanks for writing about your visit with David so that we can all share. I was pleased that Nashville showed him some love for He Is Born. That is my favorite. Thanks, Dayzee. Gosh, that was a week already…where does the time go. At this time of the year it’s busy. busy. Hmm. Should I admit to already having a few April tickets? Boise, Idaho Falls and Las Vegas tickets are in the folder. On the road again. Leave in the morning for Richfield with my granddaughter. Praying for snowless roads. I don’t know how to get there without braving some high mountain passes. A soldout Vernal show tonight. This will be the hottest thing in Vernal since my granddaughter moved away. Dayzee 🙂 there are only two ways to get to Richfield and both include canyons — unless you have a helicopter to take you in. That could be a fun way to get there!! 😀 Have a safe trip and know that since you are attending the final concert it probably be a show of shows! Dayzee, I should of known you have already started filling your folder! 🙂 Maybe he will book something closer to me this time…I can always hope. I feel lucky that I went to 3 concerts since July. ♥ Hope the weather held out for you and the final concert had to be the Bomb!! Now we go thru a dry spell for a few months…good thing we have lots of videos to watch. Abrra, the puzzle photo cracks me up!! And then there are some of the responses he got on Instagram! LOL!! He’s definitely coming out of a shell that I think we all knew was there but just not how tightly shut it really was. 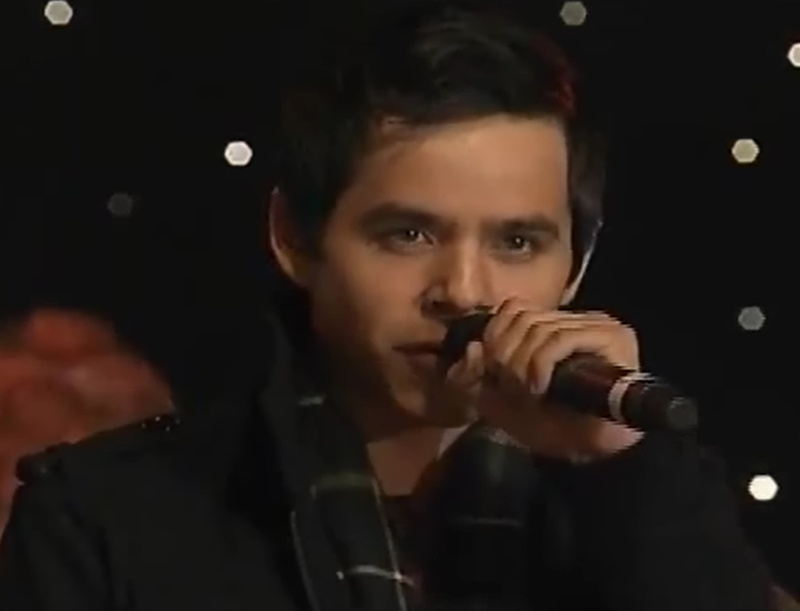 Jan I see your cute little self on David’s Winter in the Air tour video. Camera in hand. Also FodDonna who used to join us in the chat room on Saturday nights. After the Richfield show my Granddaughter said, “David’s shows are always full of light. Never any darkness or anything that would bring you down.” Well, I am still floating. At the VIP someone asked David if he was nervous on stage. He answered that he felt like he had gotten the hang of it. He owns that stage. After the show all the band members and some crew came on stage and had a group hugs. And one on one hugs. They obviously enjoy each other. Can’t wait for spring. More music. More fun More light. More David. So many videos to watch I can’t keep up. Has anyone seen O Come O Come Emmanuel from San Bernardino? I’ve been having problems posting comments so I hope this goes through. Dayzee … where is the tour video? I don’t think I’ve seen it! AAAAbraaa have you seen it? Fen, totally right … I can’t keep up either. Tawna., that video is on David’s own site under “News” and drop down to “more news” . It is on the right-hand side. Jan is at .27-.28 in a red and white sweater. Oh my, I will have to find it again and ck it out. Seen it but didn’t see me in it. There was a camera man all over the place that night in Nashville. Was wondering if he was videoing it for a special or something. Didn’t think I was in it tho. I showed the video to my daughter and she seen herself too. I only seen myself going to sit down and then she seen us both sitting down side by side. It was during the VIP. On bigger screen, I could see it better. Happy Birthday, David! Thank you for the music! Very interesting, Abs! So fun to do. I wished David a Happy Birthday under this photo when it was on FB yesterday.. There was a short video of him singing a little Spanish and his mom and an aunt singing. Looks like he had a lot of fun on his 28th! 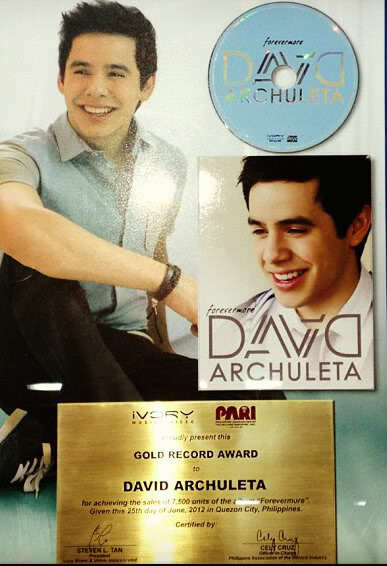 So happy for him and his upcoming success. ♥ He has such a precious soul. Happy New Year! May everyone be blessed with good health and a David concert (or two or three…) this year! I forgot to say in my recap that I talked to Dja there in Nashville, her husband flew out with her. She told me that if I turn my extra ticket into the box office and they will try and sell it. By that time, the night of the first concert, it was too late so it didn’t sell. They would have given me an automatic refund on my card. Next time I will know. I really didn’t think I would have trouble getting someone to go, but with it being mid Dec. no one could go because of various reasons involving Christmas. Hope to hear from you again, Dja! The magical camera is right, Abrra. Thank you. Warning: this one is TRICKY!! 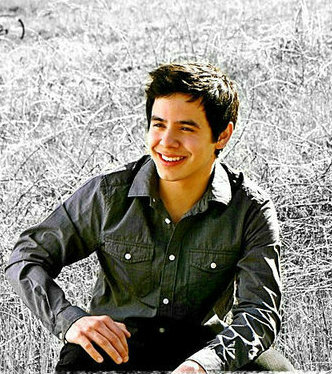 Thanks to editing skills of Lovelyarchies. A photo for every year! What fun to do. So photogenic from cradle to twenty-eight. 🙂 Thanks, Abs. Just in case anyone is interested…. Cah-razy puzzle, Abrra! 🙂 Thanks! Love it, Abs! Those 2 sing so good together, sometimes you can’t tell there is 2 voices, they blend perfectly! 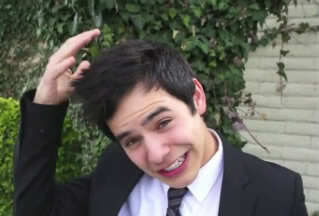 Awww the many faces of David! Thanks Abs. Sunday I looked up another puzzle of David to do. Such fun! I am still here, Jans. I just don’t seem to have anything to say except how wonderful he is. But you all know that already. Well, he’s the most attractive man in an apron I’ve ever seen! I did too, Abs and it was fun to do just like this puzzle. David always makes it interesting! I am truly puzzled why he hasn’t won a Grammy yet. Or why he isn’t the most famous singer in the world. Here is a sweet story about my 6th grade teacher and me. When I moved up to MA from NC in 1961 my first day of school was Valentines Day. I didn’t know a soul and I spoke with a thick southern drawl which made me stick out in class when called on. With all the confusion of the move, my needs that day were not on my mom’s list. I had no cards to exchange with fellow students. My teacher was a sweet old lady who came prepared for my arrival on such a day. She called me to her desk and slid a package of cards and a list of students names towards me. She said to go to the back table and get the cards filled out while she taught the rest of the class on some topic. Later in the day she announced the card exchange. Everyone was running around handing cards to each other. As each one came up to me ( the new kid) they introduced themselves. It made it easy for me to pull out the card I had for them. What could have been a day of embarrassment and alienation turned into a bonding experience with my new class. I have always loved that teacher for being so prepared to make my first day run smooth. Happy Valentines to all ! A tricky puzzle indeed, Abrra! Thanks for the middle of the week diversion. Thanks to Shelley for this beauty!